A week of unexpected flowers in the garden and hints that a return to warm weather is still possible. A lull in the rainy weather allowed me to mow the meadow but it hasn't yet allowed me to carry out a second cut. I'm a bit late this year but as long as I have finished by the end of September it will be fine. I have some work to do on the trees around the margin and I like to stop walking on it by October - the first shoots on the daffodils appear shortly after and it is very easy to damage them. 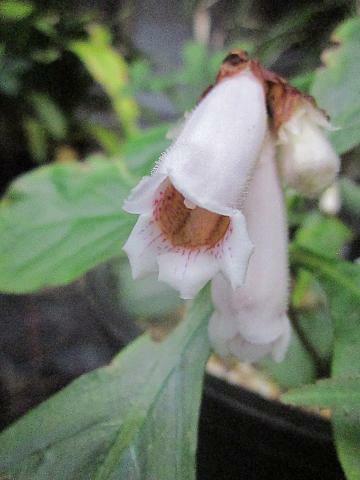 Hemiboea flowers were a surprise. Last time I looked the leafy shoots were showing no signs of buds and I thought it was going to be a dud year but a few flowers have developed in the greenhouse. I have a number of plants scattered about the place but so far there isn't one outside where it would be much happier. A plant with a complicated history, it was introduced to the South China Institute of Botany from NW Guandong and is not known in the wild. Originally described as H. henryi in 1987, it is probably a single clone that has spread into cultivation worldwide. In 1998 it was re-published as H. subcapitata var. guangdongensis, differing from the type in having the "involucre pilose outside" which is being interpreted as meaning a hairy corolla. A little further along the path in the greenhouse I grow a small patch of Geranium 'Rambling Robin', a silver leaved hybrid from the South Africa Geranium incanum. It probably needs more sun than it is getting because the growth has become thin and ragged, the well spaced silver leaves punctuated by dark shadowy gaps. 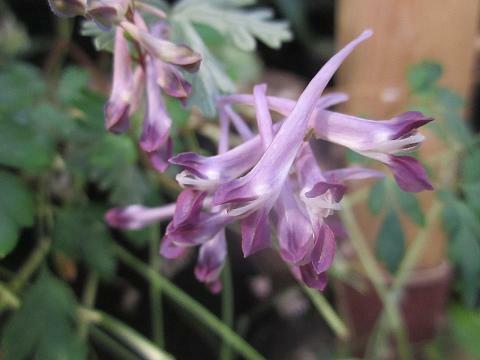 Suddenly I noticed a purple tint in the shadows, and there was Corydalis solida springing from the pot in full flower. At least I assume it is C. solida, the appearance is right it is just the season that is wrong. I grow it outside for some colour in early spring but the rabbits are as fond of it as I am so it doesn't make much of a display. I don't think they eat it, they just get curious and destroy it in the process. In the greenhouse it seemed safe and perhaps the heat has confused the seasons. In taking the picture I nearly knelt on a rabbit that was hiding between pots. I knew one had been getting in because a few plants had been grazed back, but I could't see where the hole in the defences was. Fortunately the surprised bunny headed straight for the exit and I was able to block it up. The illusion that the greenhouse is secure has been restored, though I probably have a rabbit-weight of red spider mite to deal with as well. Red spider mite pie anyone? 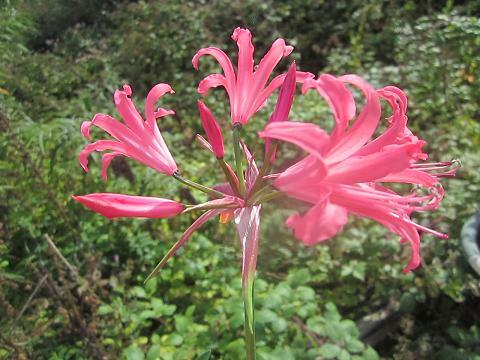 August seems too early for a 'real' Nerine (I expect some of the smaller species, but this is a large flowered hybrid). It is a curious thing, the leaves started to grow several weeks ago when N. bowdenii was dying down and long before the N.sarniensis forms have started to grow. I assume it is a hybrid of N. sarniensis but beyond that I have no idea. It makes watering a bit more complicated. I have been dithering about giving them all a drench to start the season off but I think I should wait for a couple more weeks. It doesn't help that I am standing among the pots with a hose to water this one. It takes a measure of self-restraint which is not my strongest feature, demonstrated by the fact that I have two pots of 'Ophelia' when one would be sufficient. An internet search has failed to reveal anything about the cultivar beyond my own picture of it in September last year so my contribution to the stack of human knowledge is to point out that it is bright pink, but not quite the salmon shaded pink that this picture shows (my camera survived being dropped in water last week, but has developed occasional wayward urges, not least the strange blur in the centre of the picture). 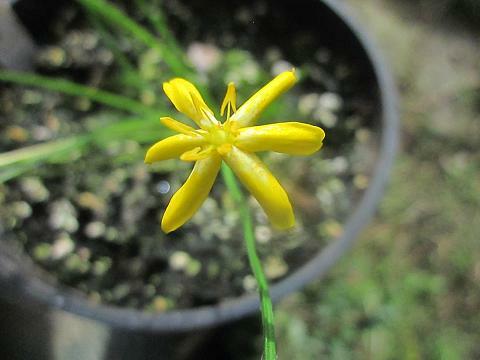 Small yellow stars have a charm about them that is something to do with childhood and buttercups, though an Australian Hypoxis isn't the most obvious fit. It comes from Queensland, Victoria, New South Wales and Tasmania. The first location suggests that it is unlikely to be hardy, the last suggests I have a chance. In the event it has survived a number of cold winters in the greenhouse without exhibiting anything resembling vigour. I have always grown Hypoxis on the dry side and it has felt a little odd to keep this one moist. In habitat it is said to be found in moist grassland and I am starting to think it prefers quite boggy conditions. Time will tell. In the spring I got fed up with the little tuft of sad looking leaves and stood the pot in a couple of inches of water and there it has remained. The leaves have grown and it has flowered better than ever before, which may be because it is standing in water or may be because the water is standing in a rather warm greenhouse. Whatever the reason, it now looks happier and by chance I was able to get a picture on a sunny morning.